Rehabilitation at Safari is different than many other pet rehabilitation facilities. At Safari, we have “fear free” rehabilitation which means that we do not force your pet to perform exercises. When you force a pet, you cause emotional harm and fear. 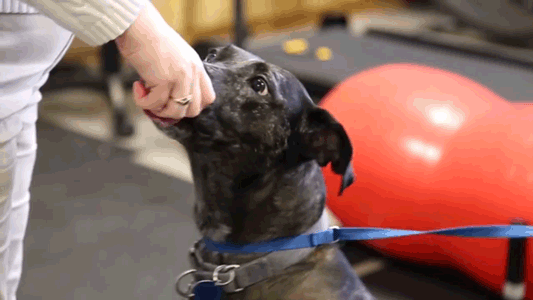 We teach the pet with rewards how to use our specialized rehabilitation tools to properly exercise. We are Certified Canine Rehabilitation Specialists operating with techniques taught in formal classes and the best tools in an environment of fear free encouragement. Rehabilitation of pets is challenging, because getting a pet to do an exercise that they do not want to do, or that may be painful for them to do at first, is difficult. Therefore, Dr. Garner’s method of “fear free” rehabilitation at Safari means we first build trust, we first establish a line of communication, we first reassure, then we train. Dogs have an innate desire to please and we tap into that desire, showing a pet how to please us and how to please himself (by receiving treats) to exercise the part of the body needing the movement. Opal is a pet that is undergoing “fear free” rehabilitation training. You can see that we are using treats to get her to exercise and to climb up on objects that are mildly unstable. Opal had a ruptured cranial cruciate ligament on her left leg and underwent TTA (Tibial Tuberosity Advancement) surgery here at Safari. The surgical repair is only part of the full recovery. Rehabilitation began one week from the surgery with focus training, mild interaction with Pilates and water treadmill. 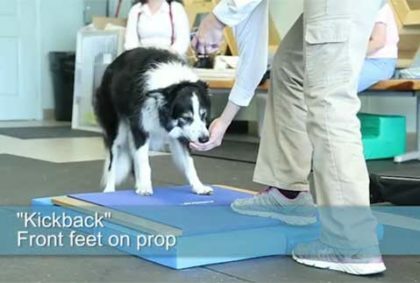 In the video, you can see how much fun she is having learning to back up and to play with the rehabilitation specialist. It didn’t take long to gain Opal’s trust and cooperation. Opal is food motivated and eagerly participated in Safari’s “fear free” rehabilitation effortlessly.